Welcome to Make It Monday with Kraft Outlet. Use this week's "Use Any Sketch" to inspire you to create your project and then link it up at the bottom of this post before 6:00 p.m. (Eastern Time) on Sunday June 2, 2013. Remember your projects MUST include the use of Kraft cardstock and/or items that can be purchased at Kraft Outlet! Also, all of our followers who participant in our challenges this month have a chance to be featured on our "Feature Me Fridays" posts as well as be entered to win a $15.00 Kraft Outlet Store Voucher! Please limit your weekly challenge entries to your TWO best creations and thank you for your participation! For today's "Use Any Sketch" challenge, Tammy followed the sketch from The Paper Loft. She used a base of Brown Kraft Cover Weight onto which she layered her white embossed honeycomb panel with the edges distressed. She used papers from the Kraft & Black Cardstock Pad, C-Flute Corrugated Kraft Paper which she painted white and distressed, as well as the Old Newpaper Washi Tape on her circles and scalloped trim panel. Before adding the circles, she took a length of Black Twill Tying Tape and wrapped it around the card face horizontally and tied in a bow adding another bow made from Natural Hemp Cord embellished with a white paper rose. Her final finishing touch was adding a handmade burlap rose and leaves which has a Memo Pin holding a Chipboard Flag Piece with coordinating Flag Banner Sticker for her stamped sentiment. Please visit Tammy's Blog, Creating Somewhere Under The Sun for additional pictures and information. Tammy will be taking a few months off, but look for her to return with us in September. For this week's "Use a Sketch" challenge, Jessica used one of her favorite go to challenge blogs, Seize the Birthday and designed her birthday card around their sketch challenge. She started her card off with a Brown Kraft Cardstock base and added her layers of Bazzill cardstock and DoodleBug Designs pattern paper. Using the The Alley Way Stamps~Bot Time stamp set, Jessica stamped the robot and sentiment on another piece of coordinating pattern paper but before adding it to her card from she embellished with some White Twill Tape and 2 screw brads. For more details and additional pictures on her Sketch inspiration card, you can visit Jessica's blog~ Chick-n-Scrap. Karen started her project by using a Large Canvas Tag to create a pocket that holds a gift card. She folded the bottom half of the Large Canvas Tag up to the top and machine stitched in place it to create a permanent pocket. This is a great use of the Canvas Tag because it's always nice to have a pocket that holds a gift card, notes, photos, etc. 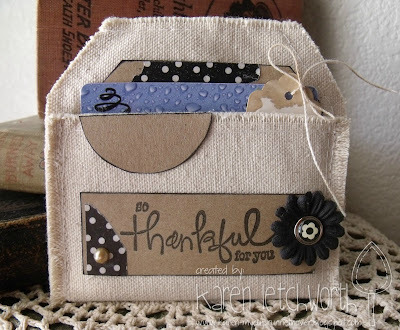 She created a tag for the pocket out of Lunch Bag Kraft Card Stock and decorated that with some Black & White Polka Dot Washi Tape snippets, and also tucked in a Scalloped Grungy Prim Tag for journaling. The sentiment is stamped on more of the Lunch Bag Kraft Card Stock, and the little flower has a Custom Fastener center. For a more detailed description of how Karen made her Canvas Tag Pocket, as well as a complete supply list and further details about her project, please visit her blog My Cup Runneth Over and take a peek! What fun projects the DT completed!